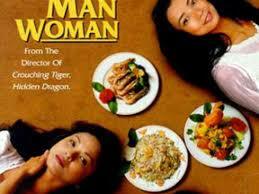 The third film in our Ang Lee's Chinese Classics. This Taiwanese drama centers upon the relationships within a Taipei family. Mr Chu, the father, is a master chef who's lost his sense of taste. His wife died so now he lives amongst his three grown daughters. All three really want to get on with their own lives. The oldest daughter Jen, is a school teacher adept at hiding her feelings after she suffered a bad love affair in college. Kien who works for the national airline as a senior executive has just put all her savings into a new apartment. Young Ning is in school and works at a fast-food joint. She is getting involved with her best friend's boyfriend. Life within the family gets more tangled when Chu marries Madame Liang, the single mother next door. In 1994, the film received the Asia Pacific Film Festival Award for Best Film, and in 1995 it received an Academy Award Nomination for Best Foreign Language Film.